Aluminum-(Silicon Carbide) is a metal-ceramic composite material consisting of silicon carbide particles dispersed in a matrix of aluminum alloy. It combines the benefits of high thermal conductivity of metal and low CTE (coefficient of thermal expansion) of ceramic. With its composite features, Al-SiC is an advanced packaging material for high technology thermal management. 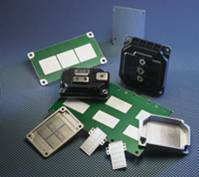 Al-SiC is compatible with a wide range of metallic and ceramic substrate and plating materials used in microelectronic packaging for aerospace, automotive, microwave applications. 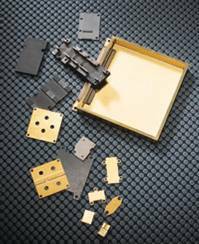 Al-SiC allows for a new packaging technology that can replace traditional W-Cu, Mo, BeO, Kovar, Mo-Cu, AlN, AlSi, Al2O3. tailor-made coefficient of thermal expansion (eliminates thermal cycling fatigue due to CTE mismatch). (almost as light as aluminum but stronger, it is excellent for aerospace, automotive and other mobile applications).